Our arrival at home from the hospital and three very curious boys: Logan, Carter and Papa. Two very proud big brothers. Paityn, post-bath, on Saturday morning. Logan finally felt that he should take a turn on his own to hold his sister. Upon being introduced to the congregation, Paityn gave a very royal wave which brought many giggles and chuckles. On this new lifestyle with three little ones: day by day, right? -- I've got half a day (that's me alone with the three) under my belt and it's not too bad. yet? I'm thankful for the season and that we can go outside to get the sillies out of little boys -- walks to the mailbox, digging in the sandbox, riding bikes and street hockey on the driveway. Introducing Paityn Mareika born this morning at 1:07am. She weighed 7lbs, 3 oz and measured 19 1/4 inches. Paityn has two very proud big brothers ready to help with anything! We are all doing great but are a bit tired after the ordeal. Papa and Gramma are here visiting/helping out/entertaining Carter and Logan while the rest of us recuperate. I'm not the only one. 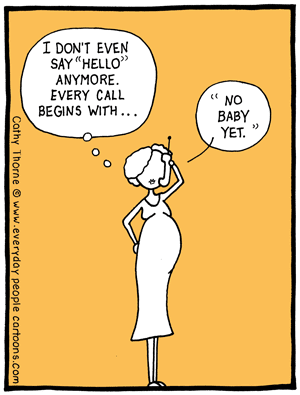 Luvinthemommyhood posted this awesome cartoon today (she's overdue though) and I had to share. I seem to get more of a very concerned "and how are YOU?" which brings my response, "No baby yet. I'm fine." So: no baby yet and I'm fine. They were absolute monkeys today but there's always a shining moment, isn't there? The boys were putting away laundry for me as fast as I could fold it this afternoon. This is what they did with the stock of facecloths I keep in the kitchen for mealtime clean ups. Normally, the cloths would be in a lovely basket. Hoping you all have had a chance to listen to this. If not, listen now!